The fashion world would not turn without coffee, so a marriage between the two seems to be a perfect match. 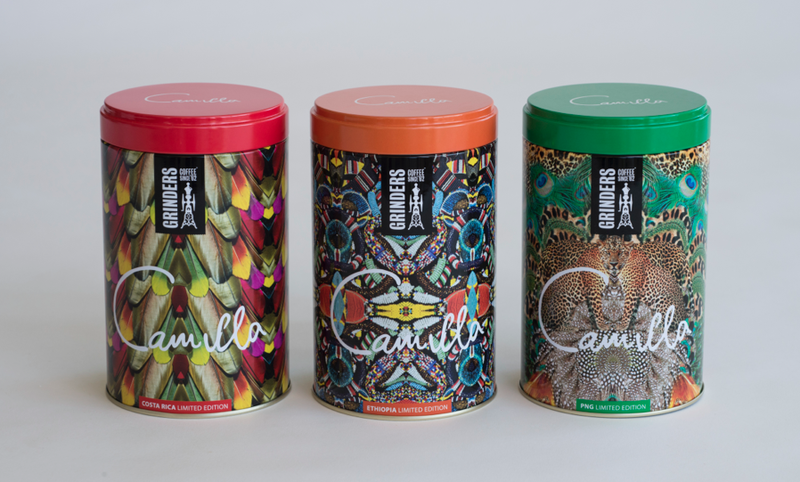 Grinders Coffee has partnered with Camilla Franks to create a collectible, limited edition range of Coffee Canisters to delight and excite Grinders Coffee and Camilla Franks devotees in a Feast for the Senses. The partnership evolved with Grinders Coffee’s wanting to work with a fashion designer who could be inspired by the countries of origin of their beans, and one who understands the indigenous heritage of those nations. Who else to ask, but Camilla Franks? CAMILLA is a global wanderer inspired by adventures far & wide. CAMILLA’s vibrant, extroverted and luxuriously unconventional print designs combined with her recent evolution into broader lifestyle categories make CAMILLA the perfect partner for the endeavour. “I am so excited to be working with Grinders Coffee – it is a really fun project! I was introduced to GRINDERS Coffee many years ago and really love the coffee! I was particularly interested to partner with them given they are one of the few Australian brands committed to producing an organic, fair trade recognized product”, said Camilla Franks. 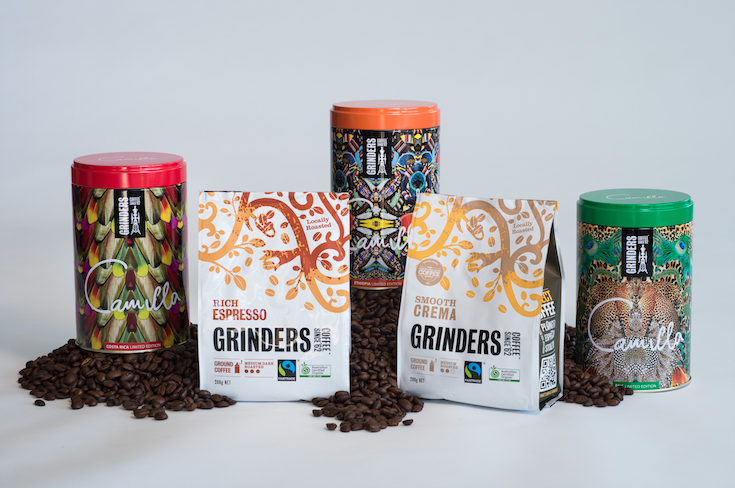 Each of the specialty canisters have a unique print designed to reflect the origin of the beans; a colourful leaf print for Costa Rica, a bright and vibrant print for Ethiopia, and a nature inspired print for PNG. The CAMILLA x Grinders range is available in Coles Supermarkets from now through to the 5th May, 2014. Consumers who purchase Grinders Coffee products will receive a CAMILLA designed canister of their choice as a gift.